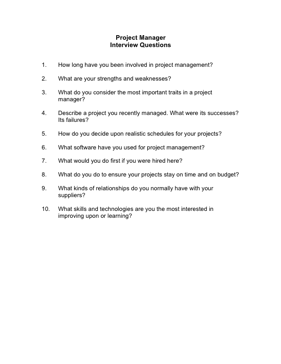 Choose your next Project Manager with the aid of these helpful interview questions. 1. How long have you been involved in project management? 3. What do you consider the most important traits in a project manager? 4. Describe a project you recently managed. What were its successes? Its failures? 5. How do you decide upon realistic schedules for your projects? 6. What software have you used for project management? 9. What kinds of relationships do you normally have with your suppliers?